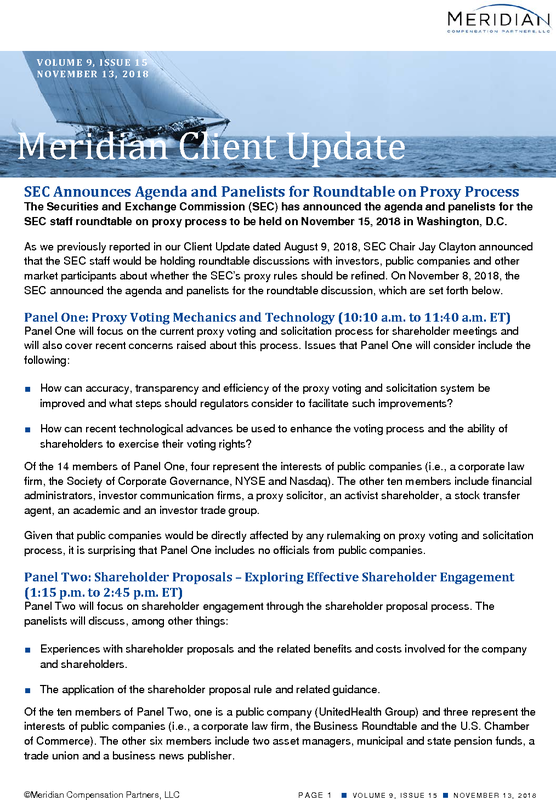 The Securities and Exchange Commission (SEC) has announced the agenda and panelists for the SEC staff roundtable on proxy process to be held on November 15, 2018 in Washington, D.C.
As we previously reported in our Client Update dated August 9, 2018, SEC Chair Jay Clayton announced that the SEC staff would be holding roundtable discussions with investors, public companies and other market participants about whether the SEC’s proxy rules should be refined. On November 8, 2018, the SEC announced the agenda and panelists for the roundtable discussion, which are set forth below. ■ How can accuracy, transparency and efficiency of the proxy voting and solicitation system be improved and what steps should regulators consider to facilitate such improvements? ■ How can recent technological advances be used to enhance the voting process and the ability of shareholders to exercise their voting rights? Of the 14 members of Panel One, four represent the interests of public companies (i.e., a corporate law firm, the Society of Corporate Governance, NYSE and Nasdaq). The other ten members include financial administrators, investor communication firms, a proxy solicitor, an activist shareholder, a stock transfer agent, an academic and an investor trade group. Given that public companies would be directly affected by any rulemaking on proxy voting and solicitation process, it is surprising that Panel One includes no officials from public companies. ■ Experiences with shareholder proposals and the related benefits and costs involved for the company and shareholders. ■ The application of the shareholder proposal rule and related guidance. 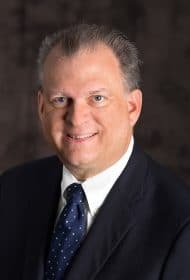 Of the ten members of Panel Two, one is a public company (UnitedHealth Group) and three represent the interests of public companies (i.e., a corporate law firm, the Business Roundtable and the U.S. Chamber of Commerce). The other six members include two asset managers, municipal and state pension funds, a trade union and a business news publisher. ■ How has the role of proxy advisory firms evolved over time? ■ Are there ways in which the proxy advisory firms’ role and relationships with institutional investors and issuers can be improved? Of the 11 members of Panel Three, two are public companies (General Motors and Atlas Air Worldwide) and one represents the interests of public companies (i.e., American Enterprise Institute (“AEI”)). The remaining eight panelists include the CEOs of the three major proxy advisory firms, three asset managers, an academic and a state pension fund. The roundtable will begin at 9:30 a.m. in the auditorium at the SEC headquarters at 100 F Street, N.E., Washington, D.C. and will be open to the public. The event also will be webcast live on the SEC website and archived for later viewing. Meridian comments. The SEC staff has constructed the panels to ensure diverse views are present. Importantly, nearly one-third of the panelists are representatives of public companies or entities that represent business interests. However, potentially problematic is the level of business representation on Panel Three, which will be discussing proxy advisory firms and their involvement in the proxy process. As noted above, Panel Three includes two public companies and one business-leaning think tank, AEI. The representatives from GM and Atlas Air Worldwide are more than capable of expressing their companies’ respective views on the proxy advisory firms. In addition, former Senator Phil Gramm, who is AEI’s representative on Panel Three, is an advocate of imposing fiduciary obligations on the proxy advisory firms. However, AEI has been largely absent from the debate on the dominance and power of the main proxy advisory firms (except for a 2014 publication of a “policy brief” which was largely critical of the power of the proxy advisory firms). Missing from this group are business-oriented trade associations (such as the U.S. Chamber of Commerce) that could give voice to the many and nuanced issues identified by hundreds of public companies regarding the large proxy advisory firms. Undoubtedly, the CEOs from the three major proxy advisory firms will be well-prepared to defend the status quo. We will be monitoring the roundtable discussion and reporting on key takeaways.